Latent (invisible) fingerprints provide vital clues for police and forensic scientists investigating a crime scene, but they can be difficult to detect. In their quest for better ways to detect latent fingermarks, Australian researchers are using the infrared microspectroscopy beamline at the Australian Synchrotron to investigate the chemistry of latent fingermark deposits. Fingermarks typically consist of an emulsion of natural skin secretions (waxes, oils and aqueous components) along with any contaminants also present on the skin. As the fingermarks age, this mixture changes as a result of evaporation, bacterial action and oxidation. Chemistry honours student Patrick Fritz from Curtin University of Technology visited the synchrotron in February to check out a series of fingermarks obtained under real-life conditions from subjects ranging in age from seven to 60. Accompanied by his supervisor Simon Lewis and research colleague Bill van Bronswijk, Patrick collected infrared absorption data from several spots on each fingerprint. Each spot is 10 microns (micrometres) square and has been selected under a high-powered microscope as coming from a fingermark ridge. Simon, Patrick and Bill are part of a collaborative team that is using a range of techniques to investigate the chemistry of fingermark deposits, including how this changes over a period of several months. The team includes Murdoch University researchers and students, who are using laser-desorption mass spectrometry imaging to examine the same fingermarks and Kieran Lim from Deakin University. Most previous studies have focused on the chemistry of secretions obtained from the body and so may not accurately reflect the chemistry of the actual fingermark deposits, particularly as these age. Synchrotron infrared microspectroscopy is ideal for the task because it is non-destructive and highly sensitive, invaluable characteristics with such small samples. It offers much higher spatial resolution than conventional IR microspectroscopy, enabling the researchers to avoid debris such as skin cells by selecting very small areas for imaging. Preliminary results show that synchrotron IR microspectroscopy is particularly good for studying the oils and found fats in fingermark deposits, and that these could reveal more information as the fingermarks age. Patrick will return to the synchrotron later this year with the same fingermark samples to determine how their chemistry is changing as they age. 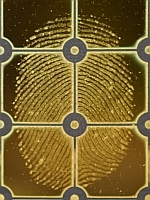 The results could improve existing fingermark detection techniques and enable the development of new approaches to forensic analysis of latent fingermarks. 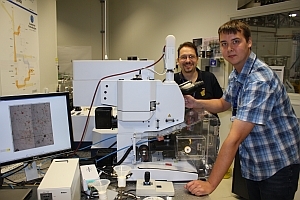 Curtin University of Technology’s Simon Lewis (left) and Patrick Fritz are using synchrotron IR microspectroscopy to examine fingermarks from people aged seven to 60. Australian researchers are studying fingerprints collected on gold and stainless steel plates to find out how fingermark chemistry changes with age. Photo: Simon Lewis, Curtin University of Technology.